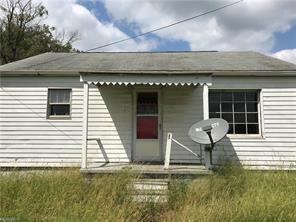 This quaint 2 bedroom home is situated in a convenient location for anyone who wants to be outside of the city limits yet wants quick and easy access to either the heart of Frazeysburg, or to Dresden or Zanesville. It is also an easy commute to Newark or Coshocton. With a bit of TLC, this property would be a great starter home or rental. Additionally, the seller's neighboring property is for sale, which is currently closed, but still under a restaurant/saloon licensing status. While not included with this listing sale, there is an opportunity to purchase the two properties together. Perfect for an on-sight owner-operator.